From mid. 16th to the late 18th c. the port of Klaipėda was established on Dangė river. 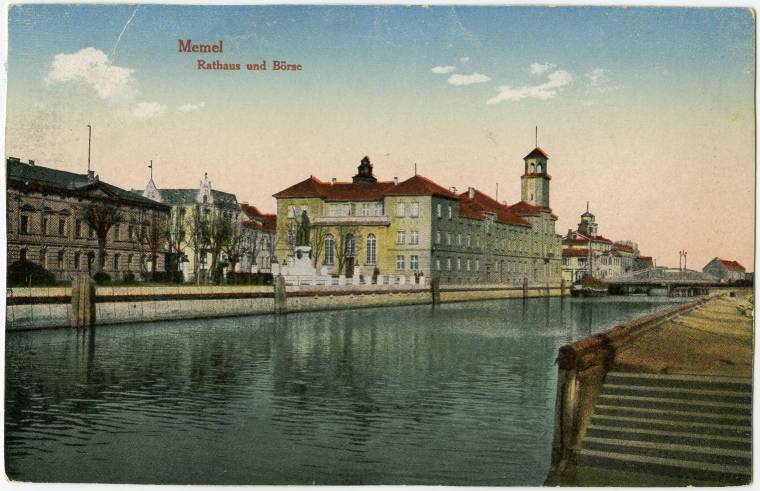 The city development began with the Memelburg Castle, built at the confluence of Dangė and Memel on 29 July 1252 by the order of Eberhard von Zeine, the Great Master of the Livonian Order, and Heinrich, Bishop of Curonia. Travelling along Klaipėda Old Town, you can take a look at the embankments of the old Dangė river port, get to know the stories of the old port, Klaipėda Town Hall and the Prussian Royal family, which resided there. Further objects feature John's Hill – a part of the 17th c. defensive fortifications, as well as the historical suburb – Pelenynas, located nearby. The right side of the river features Klaipėda Power Plant and the former UNION factory that used to produce mineral fertilisers. Its timber-framing warehouses are especially common to the historical landscape of the city. Another interesting object is the former textile and match factories, located in the territory of Joniškės Manor. As you continue, you will pass Bachman Manor – in the Middle Ages it used to supply Klaipėda Castle with drinking water. The written sources, mentioning the land of Bachman Manor, located on the left side of the river, date back to the 15th–16th c. The manor was also the where the famous Baroque poet Simon Dach spent his youth. The right side of the river features Louise Manor. In 1900 its territory on the riverside featured a plywood factory, which was the largest of its kind in the Eastern Europe at that time. After passing the bridge of Liepų Street, we will continue on the picturesque winds of Dangė river. In the 19th-20th c. it used to feature Šauliai Manor and now you can take a look at Pakrantė gardens and the new Žolynai suburb. The route turns back along Klaipėda University Botanical Garden and the Royal Tauralaukis. Travelling on this route, you will pass all 6 bridges over Dangė river in Klaipėda and will have a unique opportunity to explore Klaipėda ant its surroundings from a different perspective. The length of the route on the river is 9 km and it will take about 2 hours.